We went camping this weekend. I hope my kids will remember their camping experiences fondly. The gentlemen slept in the tent with me, while the ladies fought over the guest bed in my folks’ pop-up tent camper. When I was a kid, we used to go camping a couple times a year with family friends. Unfortunately Mom and Dad’s friends did not have their own kids until I was in high school. I hope my brother and I were not a factor in this decision. Our favorite camping spot was a lake a couple hours into Wyoming. I remember camping on an island and watching fireworks on July 4, 198?. My aunt and uncle joined us at the lake once when I was about 13. They actually had kids, their youngest at the time was probably not one yet, they had a three-year old and another around 10. The oldest cousin was a couple years younger than me, but lived with her mom most of the time. She didn’t visit her dad nearly often enough, but we always made the most of it when she was around. I don’t really remember anything specific about that time, just that it was fun to have someone new to play with. Do you remember that Jules? The Wildflower family doesn’t do things the easy way. If you are picturing us pulling up to the island in a motorboat, you are sorely mistaken. We had an inflatable rubber raft and a few paddles. No waterskiing for us. I remember quite a bit of river rafting. This would not be serious white water style rafting, but the river did have some interesting spots. I also remember my folks rowing across a huge lake because they left the pickup at the wrong end of the lake. Oops. My crazy uncle kept rowing the opposite direction as the other rowers. I don’t believe they kicked him off the raft, but I know they wanted to. We camped in a tent. I remember sleeping in the tent that belonged to our then kidless friends with my brother once. It was in the mountains somewhere and really cold, as in it snowed that night. The wind also blew, and blew our tent over. I have vague memories of thinking a bear was after us, but then going back to sleep (or possibly into a temperature induced coma) when nobody ate me. When we woke up the tent was under an inch of snow. Two preteen sized bumps in the snow were the only signs a tent was ever there. I had to take the van in for something and I drove past the dealer’s camper lot. I found my dream camper, so I made the guy give me a tour. Oh, it is just what I would want. It is pretty hard to justify something like that when we don’t go anywhere. That and the fact that we don’t have the money in the first place. But a girl can dream. I took pictures, and if I had fast internet, you’d be looking at ’em. GD pointed out that maybe it won’t sell this year and they will knock a lot off the price. Yeah right. But if we don’t go anywhere, why get it? They wanted $11,500, and it is an 02. On the way home I did something I’ll bet most of you haven’t. The little community just north of us (on a US highway) has a couple of road side melon/produce stands. This time of the year not much is ripe yet, so they don’t man the stands. They chain a tool box with a slit cut into it to a table and post a price list. I got 12 ears of corn (mmmmm) half a dozen ugly tomatoes, two zucchini and four huge bell peppers for $10.50. I wrote my check and slid it into the slot. In two weeks things will really take off and I could buy pretty tomatoes from real people. Some people from Washington stopped as I left. I wonder what they thought! I made a zucchini cake today and as I cracked my homemade eggs, I found little specks of blood. This is very typical of homegrown eggs, and it is perfectly safe. I guess they breed the anomalies and the color out of eggs at the factories. Some people candle their eggs, I don’t know what that is really, but I guess you can see things that customers may not want (like specks of blood). GD killed the rooster earlier this month (after he attacked me), cooked him and fed him to the dog, so we definitely won’t have any eggs with chickies in them. All he was doing was harassing the hens, maybe they will re-grow their back feathers now. It is embarrassing to admit I bought zucchini, but our garden is a complete train wreck. In my defense it was under water three separate times, and it had standing water for a few days too. I planned to get out there and weed it tonight after Paul went to bed, but he didn’t zonk out until after 10. GD would rototill if I just found the things he was supposed to miss! I planted zucchini and a few other things, but they got planted late, so they will be producing late. I have my fingers crossed. The atrazine from the corn field across the road wiped out our raspberry bushes. They looked beautiful too. Somehow the tomatoes survived. My friend OBL wrote about her disappointing experiences with farmer’s markets where she lives. I don’t know what planet Barbara Kingsolver lives on, but I have never seen a market like what she describes. Nobody sells lettuce or anything early, they don’t even set up until after July 4! The informal one has maybe four vendors, the honey guy, the two roadside stand folks from the next town and maybe another guy who just sells corn. On a side note, I used to drive by a sign that read “Corn on the Curb.” How clever is that? The more organized market is now defunct. They had several more vendors, a meat guy, the honey guy, an herb woman, homeschoolers selling homemade cookies, and someone who made goat milk soaps. I don’t think the farmers from up the road even had a spot there, probably because they had to pay for it. There might have even been some crafts too. You certainly couldn’t count on getting much in the way of groceries there. I guess the more farmer’s markets get patronized the better they will be. I hope so. Ten dollars says that is the headline on one of the three local daily papers tomorrow. After the tornado went through Kearney a month or so ago, I saw a photo on the news showing the drive-in theater screen with a few panels missing. I thought “Uh oh.” Yep, they tore it down today. I very rarely go to the movies, and driving an hour to do it was not very convenient. I had only been to this theater once. I am not sure I ever went to another drive-in, but I always wanted to. Nebraska still has two operational drive-in theaters. One of the theaters is kinda close to where I grew up (an hour away ) so I will have to take the kids one of these days before that one gets torn down too. They never even gave the town a chance to raise money to help fix the screen. Do you have drive-in movie memories? (Hat I am sure you do but I’m not sure I want to hear them!) Do you have a drive-in near by? Do you go? I fed my kids cookies for a snack, then made peanut butter celery sticks for myself. Pretty soon the kids were eyeing my snack wanting some. I organized a home circus complete with elephant, tightrope walker etc. I made the ladies pack for themselves when we went on vacation – with photos from catalogs telling them what they needed and how many. I lock my kids out of kitchen so I can cook supper and watch Friends in peace, except lately I have been having one of the ladies “help” me cook. It is so hard to get them to play apart from each other, and I can’t cook with three or four kids in the kitchen. I labeled several objects throughout the kitchen by name, so Mae could work on her reading. Then I moved them a week later so the door says fish and the fridge says chair. I took the kids to the sitter so I could take a three hour nap. I can be talked into reading to them for hours on end. I’m pretty lax with sunscreen, because our lawn is so well shaded. I let my kids dress themselves nearly all the time. I keep driving past the water park with vague promises that we will go this summer, but I have only taken them to the wading pool once, and it is free. I admitted in front of witnesses that the bathroom is my favorite room of the house, because the door locks. I recently found myself resisting sharing an avocado. I mean seriously, I have a kid who wants to eat a healthy vegetable and I won’t share it with him? We have flashlight safaris in the living room. I drink pop and don’t share it. I rent Looney Tunes from Netflix to distract my kids so I can clean the kitchen. The kids are used to being hustled out of the house because I usually try to do one too many last things before leaving. 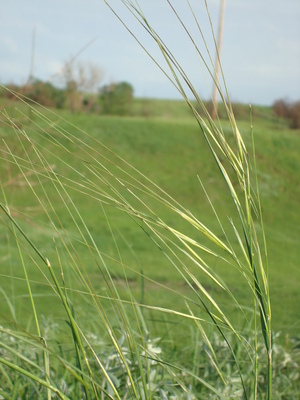 Perennial, grass family, found in drier sites across the Great Plains. Needle-and-thread is related to two other very similar species. This cool season grass (it matures in the late spring) is a staple of drier ranges. It is both drought and winter tolerant. Its seeds are very sharp with a long twisted awn attached, thus its common name. American Indians bound rows of seed heads into bundles and used them for a comb. Perennial, figwort or snapdragon family, Eastern Great Plains. It is also called beardtongue and bluebells. This plant is striking due to its height as well as its showy flowers, but disappointingly it has no scent. Several species of Penstemon grow in Nebraska, but only one is scented and it is done blooming. I may write about it later, if I see any, which I probably won’t. 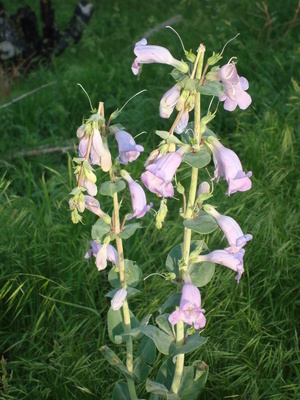 Several tribes used Penstemon to treat a variety of ailments including stomach aches, chest pains, vomiting, toothache and both snake and eagle bites. The Lakota Sioux made a dye from another Penstemon for use on moccasins. Perennial, sunflower family, various species found throughout the Great Plains. American Indians used Echinacea for many things and passed this knowledge to pioneers. They treated mumps, smallpox, snakebites and bee stings, toothaches, rabies, arthritis, and stomach cramps, as well as symptoms of the common cold. Some tribes used it as a stimulant like primitive caffeine. In 1871 Dr. H. C. F. Meyer, a patent medicine salesman of Pawnee City, Nebraska, who had heard about the use of the plant by the Indians, marketed a tincture of the root as Meyer’s Blood Purifier. This potion was touted to cure syphilis, gangrene, diphtheria, cold sores and malaria as well as everything the Indians used it for and many other diseases as well. Dr Meyer was so sure of his blood purifier, he offered to let a rattlesnake bite him, then he would cure himself using only his medicine. 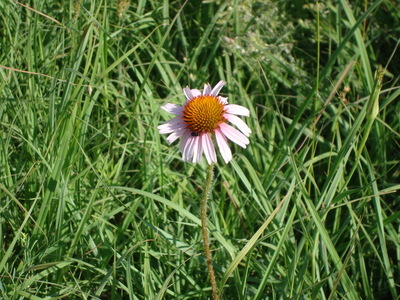 In the 1920s scientists tested Echinacea but could not find evidence that it cured snakebites, anthrax, botulism, tetanus or tuberculoses. It does have medicinal properties, aside from treating colds. If you peel the outer skin from the root and chew on the black and white tap root your mouth will tingle in a metallic way and go numb, apparently it has numbing properties when used topically as well. Asclepias speciosa Nebraska is home to 15 species of milkweed, and many of them are very similar. Perennial, milkweed family. In the 1940s, the US government began ordering lifejackets and flight suits lined with milkweed because it is light and very buoyant. It is also used in comforters. 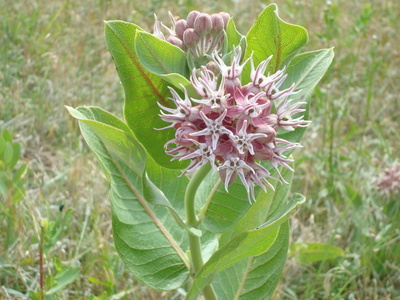 Milkweeds have an incredibly sweet odor, but the scent masks several toxins. Monarch butterflies eat large amounts of milkweed while they are in the caterpillar stage, and retain the toxins once they become butterflies. Birds learn to avoid eating monarchs because of this. American Indians cooked milkweed much as we might use cabbage. Children chewed the sap like gum. Dried seedpods served as spoons. The most interesting medicinal use was to aid in lactation. They believed the white milkweed milk would encourage a mother’s milk. If that weren’t enough, they also used it to cure tapeworm and as a contraceptive. I am pretty sure my contraceptive does not guard against tapeworm, but maybe I should ask my doctor. 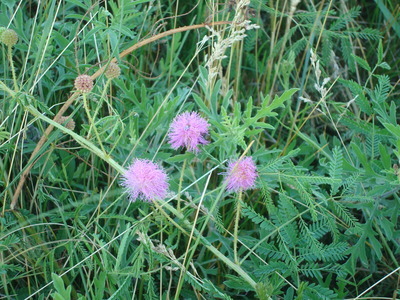 Perennial, mimosa family, found throughout the central and southern Great Plains on dry disturbed sites. Rather than the flower what you actually see are tubular pink stamens each tipped with a yellow anther. The leaves of this plant collapse inward when they are disturbed, and they are great fun to mess with. The leaves may collapse to conserve moisture. I am running scared. This whole George Bush legalizing wiretapping thing has me as nervous as a career politician in a room full of anarchists. Somebody from Virginia, and you know who you are, has viewed my website 8 times, about every hour and a half, since midnight last night. This has been going on for weeks and weeks. Pray tell have I written something that will compromise national security? Is it my party affiliation? Is it a internet version of a robo-caller? Is it because I blocked RonPaul08? Am I so interesting they must check on me several times a day? I don’t read my blog several times a day – and I love to read my writing! Why not subscribe and get over it? You know, when I worked for the USDA I had security clearance of the most elementary kind, is someone afraid I will reveal Ted Turner’s Nebraska address? Where certain endangered plants can be found? How to get your land enrolled in the CPR haha inside joke(CRP)? I hate to think of not looking at my footprints anymore…it used to be fun to speculate what the person from Australia was after but now, I don’t know. I was really tempted to put the Anarchist’s Cookbook on my Currently, but decided against it. Maybe just putting it here will redlist me. I laid awake last night thinking of grammar. I like to think I have a pretty good handle on the written word. I admit I overuse commas, and semi colons remain a mystery, but otherwise I think I am pretty good. I took the grammar test on the Daily Writing Tip’s web site and got a 70%. Not a stellar score, but it has been 19 years since I took Mrs. Kortum’s College Comp class. I may not always be right, but I know where I might be wrong. Double punctuation is another problem of mine. Now we find ourselves mentally pronouncing “Lewis”. Loo-ess, how is that different from her example of Moses? I say that Moe-sess, not really an “iz” sound, and while I am here, doesn’t Jones end with an “iz” sound? I will let it stand. Please forgive me if you think it should be “Lewis’s”, or better yet tell me why it should be. You could also tell me if I should have the comma next to the “s” or after the “”” mark. My next question is, do you know anyone named Meriwether? It seems that name has gone out of general usage. I am thinking of going with an occasional theme for Monday, like Memory Lane Monday but that sounds really corny. How about Monday Musings? I think I will go with that. 1. vti think about something: to think about something in a deep and serious or dreamy and abstracted way Encarta ® World English Dictionary © & (P) 1998-2004 Microsoft Corporation. All rights reserved. and we know Bill Gates is the authority on all things. My musing today is a recipe. Many of my good memories revolve around food. I remember good restaurants and what I ate at them. I get excited when I learn a new cooking skill, like making crepes (incredibly easy… now if I could only get someone else to eat them with me). I love to try new recipes, I love eating. Occasionally Mom used to make this completely unique dessert. It is called Ritz Cracker Pie, and it is wonderful. Add ½ t baking powder to 3 egg whites. Beat until stiff. Gradually add 1 cup sugar and 11/2 t vanilla, beating again. Gently fold in 1 c chopped nuts and 20 crumbled Ritz crackers. Pour into a 9 inch greased pie plate (8X8 works better for a carry-in dish). When completely cool, spread with one cup whipped heavy cream. I think of a recipe as a guide, so I start altering things the second time I make them. Believe you me this does not need to be refrigerated 8 hours. It changes and is good after refrigeration, but it is plenty good without waiting 8 hours. I have put fresh fruit and whipped cream in this, it is good with ice cream in it. I bet it would be good with just a drizzle of chocolate, ooh and maybe a mint leaf. I will have to try that next time. I just ate three pieces (there wasn’t enough for everyone so I took one for the team) so the next time I make this will not be very soon.